The Vogue C26 Gen2 is a combi gas boiler which will supply your hot water and heating on demand directly from the mains water supply. This means you don't need to have bulky tanks or cylinders making it the perfect choice for smaller homes. 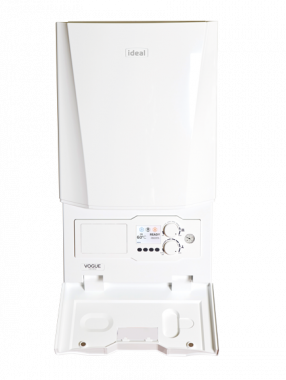 This condensing, wall mounted boiler has been designed and manufactured by Ideal and includes a wide range of different features. It has an efficiency rating of 89.2% making the unit an B rated boiler and has an output rating of 26kW. This means it’s perfectly adequate for smaller properties that do not have a high demand for hot water. This unit has been manufactured with premium components including multi function buttons, an easy to read pressure gauge, uniform control opening, cool door technology, with full size door complete with damped opening, up to 7:1 modulation and a stainless steel heat exchanger. It has a low lift weight of 30.7kg and is completely compact which enables a quick and easy installation to help save you time and money. The 3.5 backlit LCD full colour display will help you control your heating effectively and achieve maximum efficiency. It also includes a 10 year warranty on parts and labour so you can be sure that you are getting a highly reliable unit. Superb boiler, easy to maintain, easy to fit, very reliable, good quality parts.